June 17, 2013 April 27, 2016 by midgeguerrera, posted in Food - Eating In and Out! Gardens all over Pontelandolfo are bursting with zucchini flowers. Folks plant tons of plants – not because they are looking for an abundance of zucchini to give to their neighbors, but so they can eat the blossoms! First step was to pick the flowers. In Flagtown, NJ where we have tried to plant zucchini, the deer get there first. Here in Pontelandolfo, deer are not a problem. Midge, who loves fried zucchini flowers, is the natural predator. 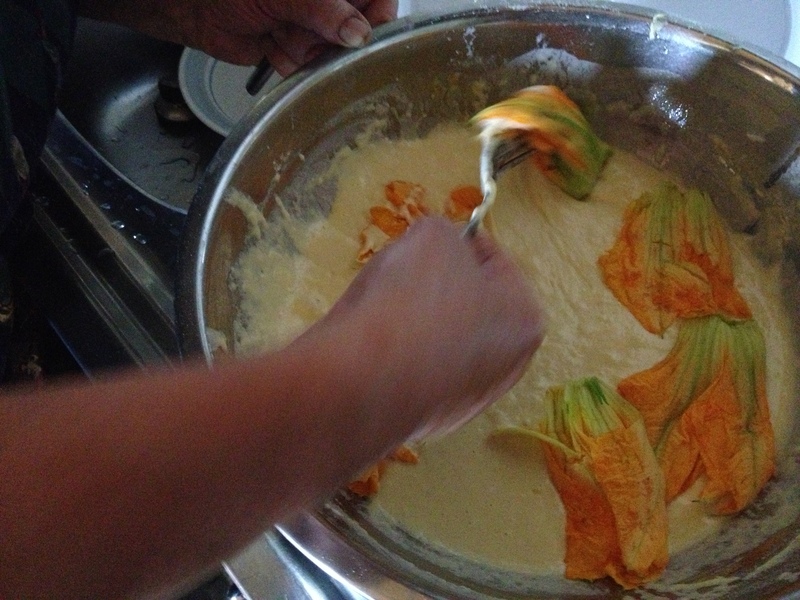 Today, when I got back to our house Zia Vittoria,our fabulous landlady, walked out and said don’t cook – I have fiori di zucca. Well, I don’t really know what she said because she speaks the dialect of the village and I only understand about 10 %. But – I saw the flowers – and I knew where she was going. So, I volunteered to help her fry up a batch and learn her technique. I’ve made these too and my recipe is a bit different. We will follow Zia Vittoria’s recipe and talk about mine later. 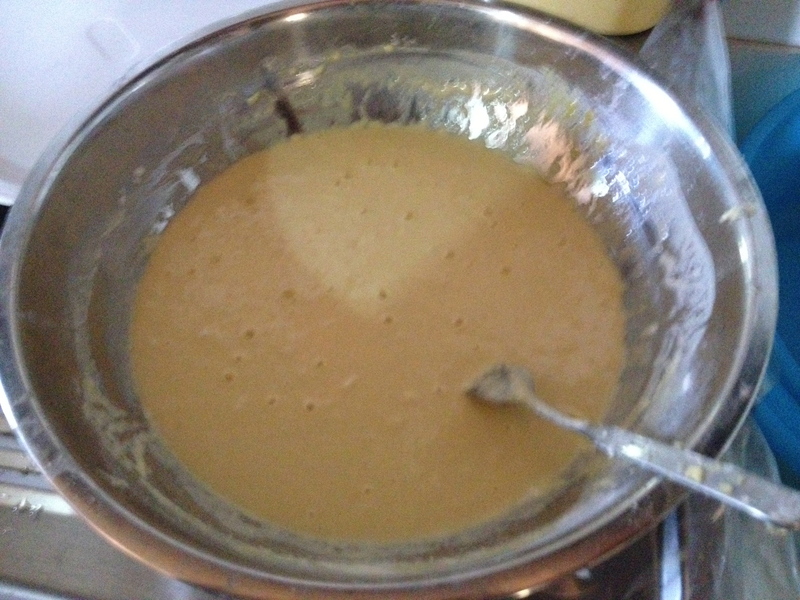 Flour, eggs, salt and tad of yeast powder. Let it sit a bit. It looked and felt like the consistency of pancake batter – or a Bisquick batter. She had it resting in front of a sunny window and it was uncovered. How pretty those sweet things are. 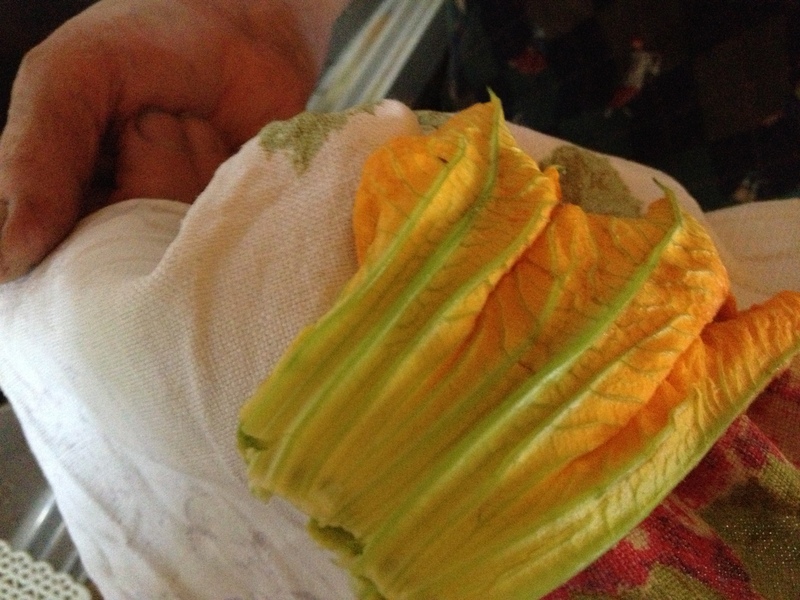 The zucchini blossoms were fairly large. First we popped off the stems. (I’ve never seen that done before) Then we washed them and let them drain. Squish and they are flatter and bigger looking. This next step was totally new to me. She took a dish towel, hand dried each blossom and flattened it. Just a bit of pressure between two sections of the dish towel. Blossoms just floating in batter. Then she dumped a bunch of them into the batter and let them sit a while. Most village homes have more than one kitchen. 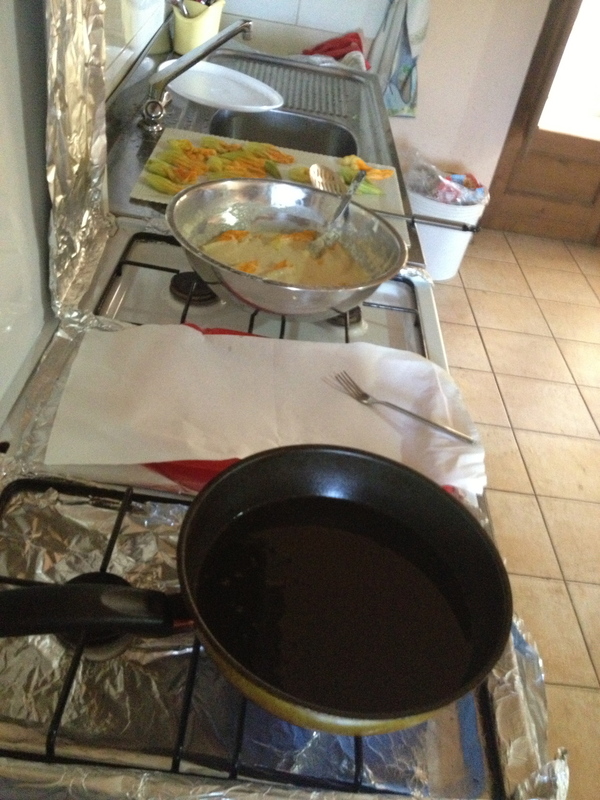 The working kitchen where you make really messy stuff, like huge vats of sauce, smoke prosciutto, can vegetables etc. This home has a working kitchen in a small separate house – with a huge fireplace and wood burning oven – they really do smoke meat there. 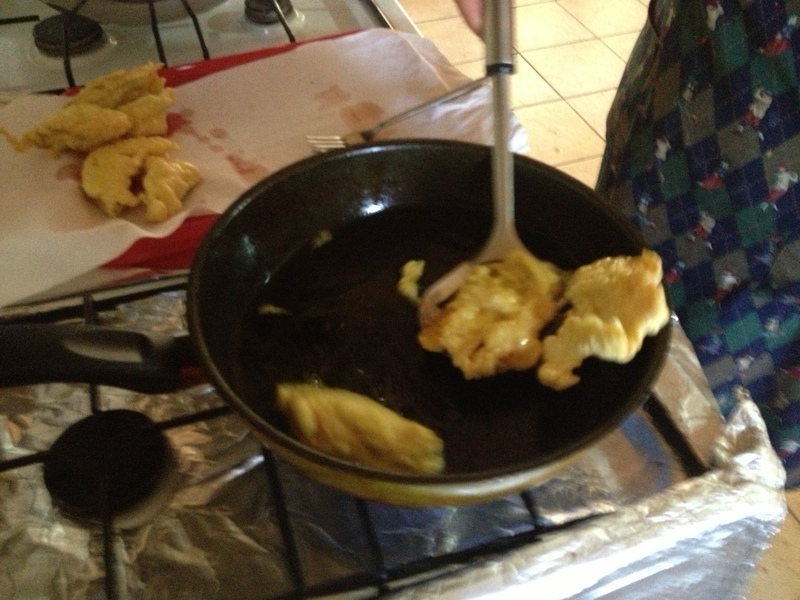 Meanwhile she choose a small frying pan with high sides and filled it about 3/4’s of the way with olive oil. She ladled the oil from a big vat in her working kitchen. I was shocked! We have all been told for years not to deep fry in olive oil. I asked her and she said something like, ” why should I buy oil to fry in when we make our own perfectly fine olive oil.” I waited to see if it would smoke or flame or turn us into strega – but no it worked perfectly fine. 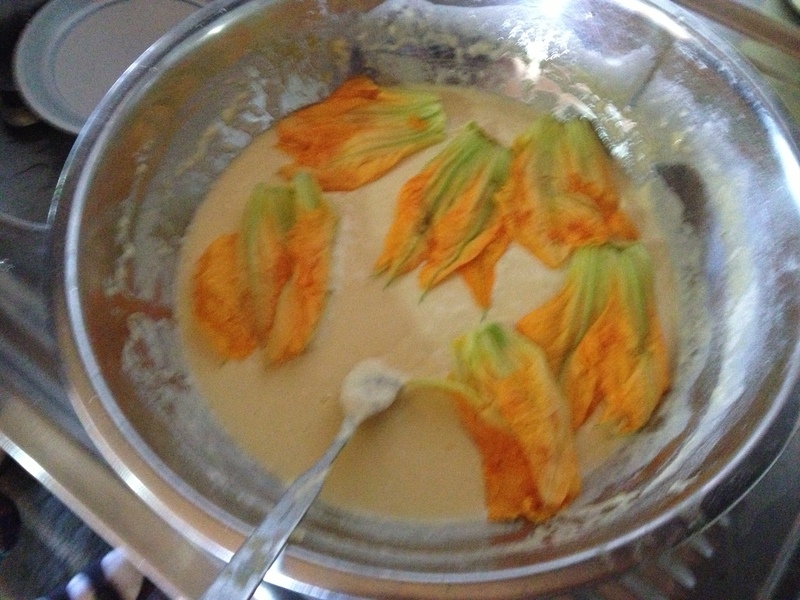 The next step was to gently turn each blossom in the batter. She used a flick of her wrist and didn’t tear one flower. At this point my mouth waters. By now the oil was sizzling and bubbling – stil no flames of death or smoke. Each blossom was plopped in the hot oil until she filled one layer of the pan. After the first side was brown, she used a slotted spoon and flipped them over. Meanwhile, I put paper towels on a number of trays – yes I got the simple job – I washed the dishes too! I should have doubled up the paper towels. When the second side was brown the blossoms were taken out – again using a slotted spoon and placed on paper towels to drain. At this point, you can add some salt to them. Here is the finished product! They were enveloped in a light pancake and very tasty. Instead of an appetizer this turned out to be lunch – we couldn’t stop eating them. Mine were a little different. What follows is a batch I made last week from some purloined blossoms. 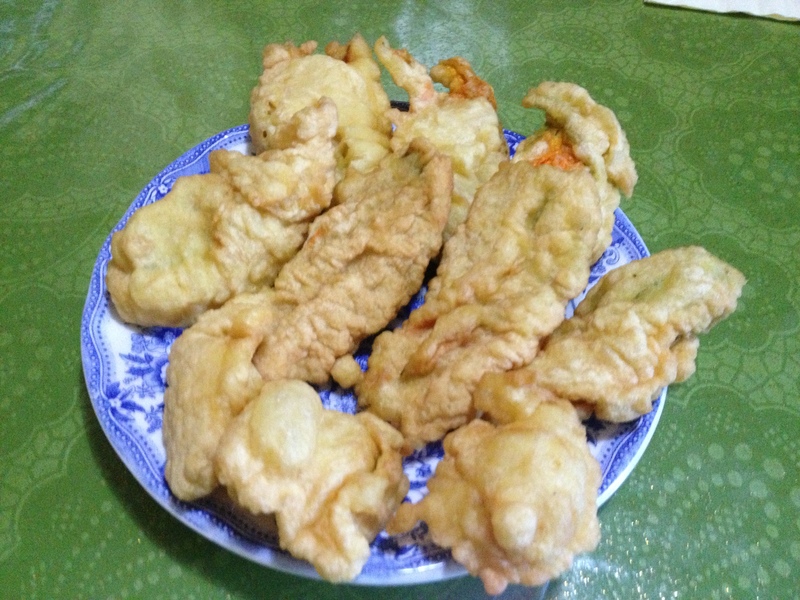 I didn’t use yeast – just eggs, flour, salt and pepper. We had some left over cheese that was drying out so I sliced chunks and stuck a few pieces inside each blossom. Then I dredged them in the batter and fried them in canola oil. As they were draining, I did toss some salt on the blossoms . They came out really crispy and light with oozing cheese in the middle. Ohh This reminds me so much of my friend Louise who introduced me to fried zucchini flowers. Definitely a fabulous dish. They had them at the farmers’ market this Sunday. Now I wish I had bought some. Do they make trumpets out of the stems? That is so fun. As for the Olive Oil, there is a bit of controversy about the smoke point (the point at which the oil starts to break down) of olive oil…in that, the oil breaks down before there is actually “smoking’ so it is possible, if you believe in this stuff, that you have created free radicals. Again…this is controversial…and there are “experts” who can argue both sides….I say…how can our relatives be wrong! I have a feeling I may be gaining weight this trip! I looked on line and read both sides of the olive oil story too. I couldn’t really tell whose radical is free and whose radical is just an Abbie Hoffman 1960’s look alike. I do know they taste good. HAHAHA! Abbie Hoffman! 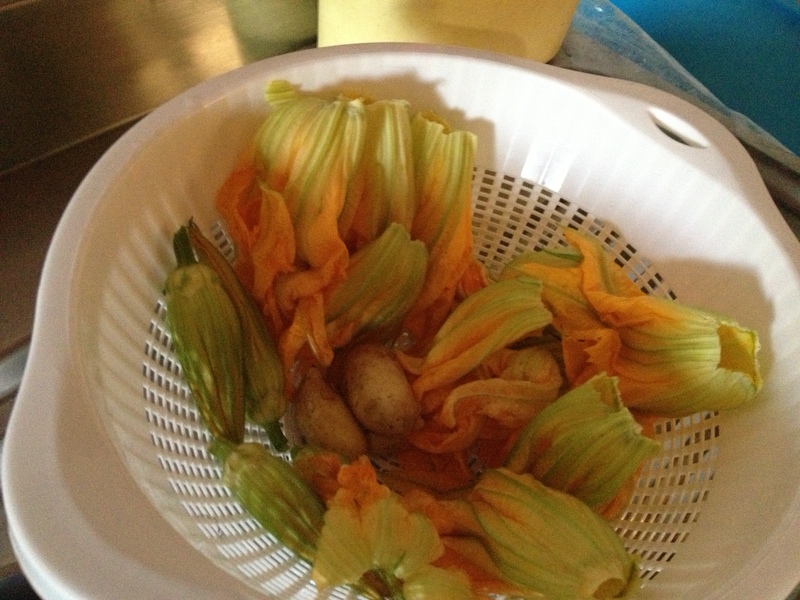 Just as a side note, I thought YOUR zucchini blossoms looked and sounded SPLENDID! Love is a zucchini blossom. . The Trenton Farmer’s Market, Kern’s Corn Market and Blue Moon Acres usually have them in season. Great to know! Thanks for the tip. Buon Giorno Midge and Jack – Looks like you’re having a grand time! 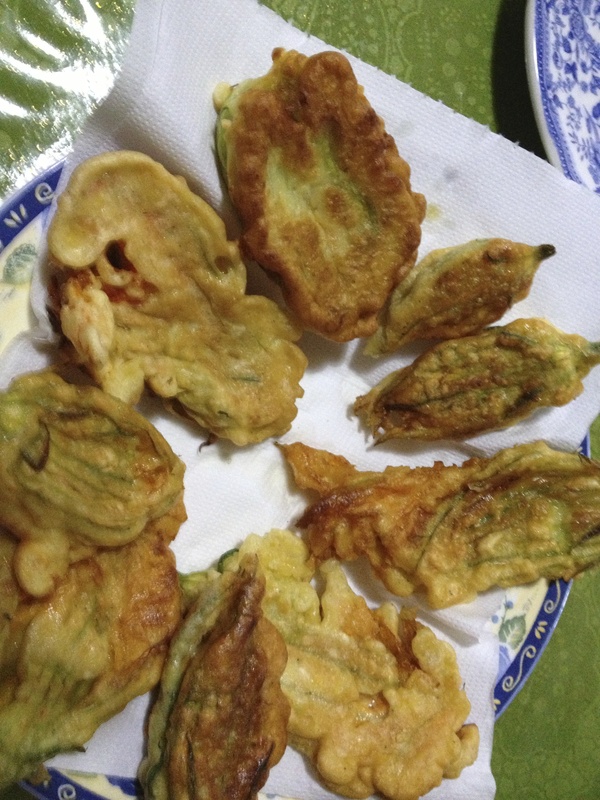 So now I shall have to go plant an additional zucchini plant in my garden just for flowers to fry in batter! Fabulous blog. Enjoy the opera for me! “Ahhhhhhh Zucccc Chiiiini Mio” insert trill before eating. 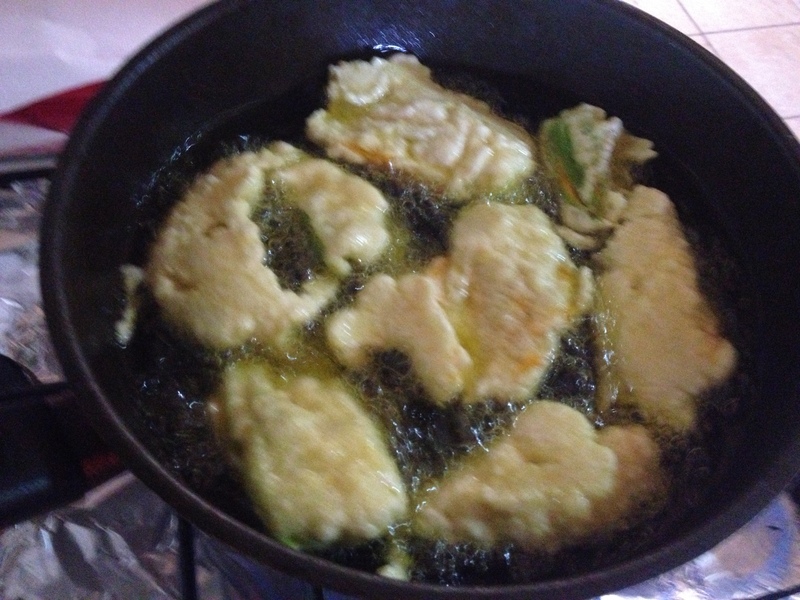 My grandmother used to make fried zucchini flowers with our Aunt Zipippenella. Delicious! Both sound like great approaches; yours sounds earlier and with varied flavors. It reminded me of the Nepalese child sitter I had when my daughter was young and she would collect fiddle ferns before they uncurled and did the same – also amazing. If you can get some goat cheese to stuff them with you’ll really love them. Do they have goats in the village? We have lots of sheep here. They roam the hills and streets. Cows wear bells and are free ranging in the mountain. The goats are around but not as visible. Cheese is made here daily from the local herds. It is foodie heaven. My family is from Pontelandolfo. 1) For fried squash blossoms, my mother used a batter of flour, milk, eggs, and baking powder (baking powder provides lift and spread). Make sure the fried flowers are seasoned properly with salt after frying. 2) Everything fried in olive oil, but NEVER use extra virgin oil because, A) you’re not looking to impart EVOO’s pronounced flavor to what you’re cooking, and B) The smoke point is closer to 400 degree f. This is okay, since most foods you fry will be under 400 degrees anyhow. Rocco, these are great notes. Thanks for sharing.